Get a FREE Review of Up to 3 Fertility Charts! Get Christelle to review your fertility charts FREE! Simply enter the data from your fertility chart into the form below and click "submit." Your chart analysis will appear anonymously as a new blog post on the St. Croix Birth & Parenting blog. Enter your temperatures by cycle day in the first column. Important: Cycle Day 1 is always the first day of your menstrual period. If you chart cervical fluid (sometimes called cervical mucus), enter those observations in the second column. Enter any other notes or observations in the third column. If you have any invalid temperatures due to taking too early or too late (more than 30 minutes before or after your usual time) or if you have any other reasons your temperature might be invalid, please note this in the third column. If you missed any observations, just leave those squares blank. 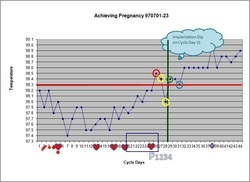 If your fertility cycle is longer than 35 days (counting from the first day of your menstrual period to the day before the first day of your next menstrual period): add those observations in the "Any Other Comments" box at the bottom of the form, making sure to note the cycle day for each observation. Limit of 3 fertility charts reviewed per client on our blog. If you would like more than 3 fertility charts reviewed, please book a "Get Pregnant Naturally" Strategy Hour! If you are not already a subscriber to St. Croix Birth & Parenting's e-newsletter, Currents, your name will be added so that you receive notice when the chart review is added to the blog. You may unsubscribe at any time.